It’s Christmas eve and finally ready to start my holiday baking. Last minute, maybe? Definitely. But I’m okay with that. My favourite Chex mix is in the oven toasting. I’m about to make tiramisu for the first time. And I busted out the white chocolate and candy canes for something a little different this year. Usually I make peppermint bark. First, this recipe was my standby and then this one took over. Both are wonderful. But I wanted to try something different this year. So I added popcorn which makes everything better. It’s just as easy and not too sweet. 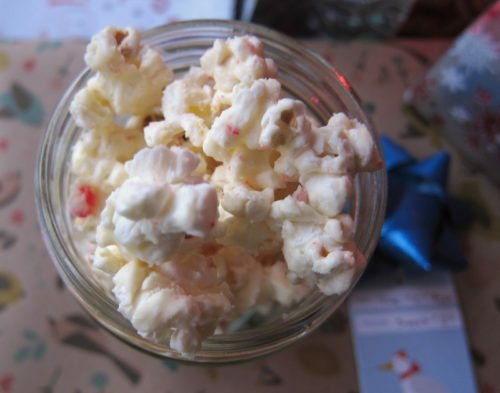 Candy canes get crushed in a food processor (tip: use ear plugs because pulverizing candy is LOUD). Popcorn gets popped (I use a hot air popper but your favourite method should be fine too). White chocolate gets melted. There’s some peppermint oil too. Mix, stir, salt and cool and you’ve got something festive and delicious. 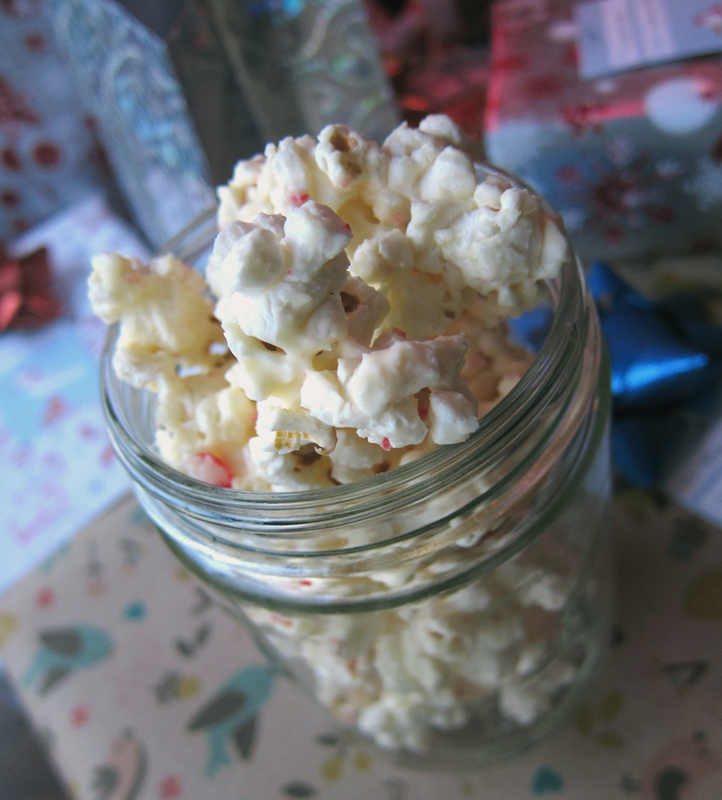 This recipe also makes a ton so there’s enough for sharing, last-minute gifting and selfish snacking to your favourite Christmas movie. Hope you all have a wonderful Christmas and spend time with the people you love the most!! 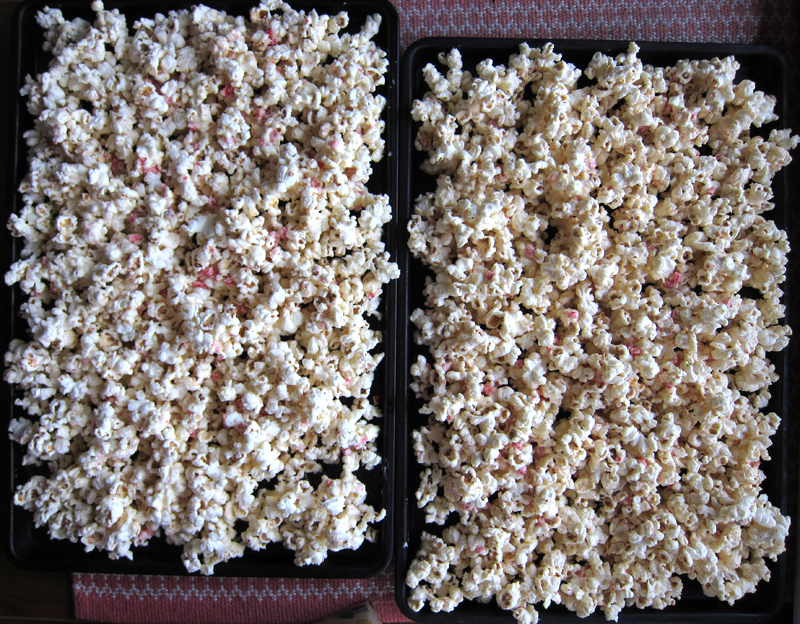 Divide popcorn into 2 large bowls. 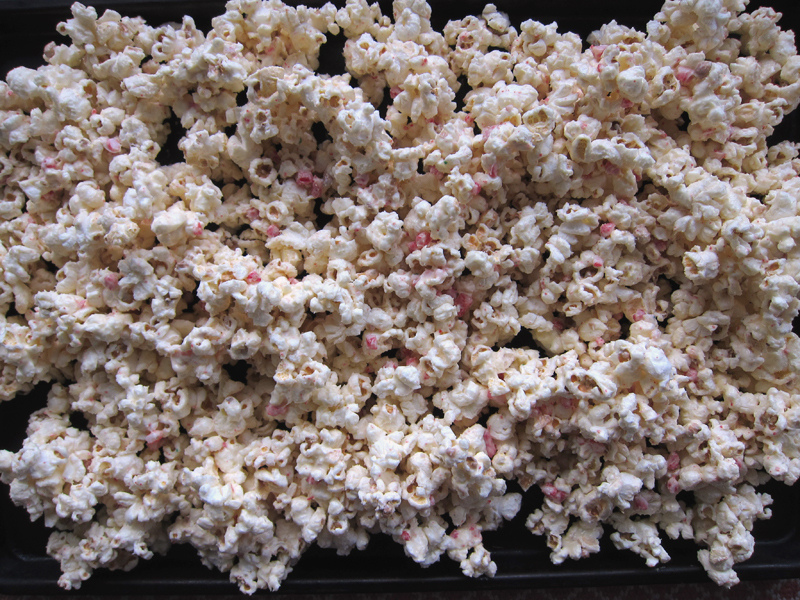 Crush candy canes using a food processor – the closer to powder you can get it the better, but some chunks are good too! Melt white chocolate in a pot over boiling water (bain marie) or in the microwave. When smooth and melted, add in a few drops of peppermint oil, depending on how minty you think you’d like. Pour melted chocolate over the popcorn and then add in the crushed candy canes. Stir well so that everything is evenly coated. 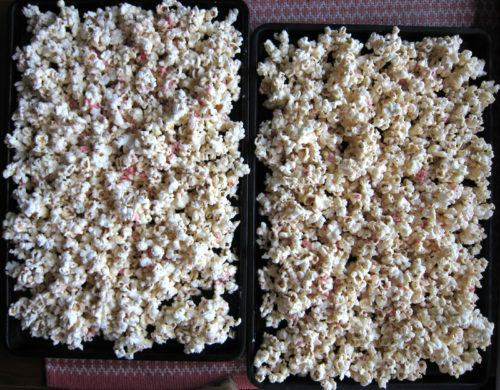 Spread popcorn out evenly over 2 baking sheets covered in parchment. Sprinkle with kosher salt. Let cool (I placed the pans in front of an open window to cool things down quickly) so that the chocolate hardens. Pack in tightly sealed containers or dig right in! If only I had white chocolate and candy canes, I would make this tonight. My husband will love this! Great idea. Definitely need this in my life!! YUM! The peppermint is such a nice festive touch to the popcorn! Candy canes should be on sale today so I’ll have to go pick up a box for this! This sounds divine! 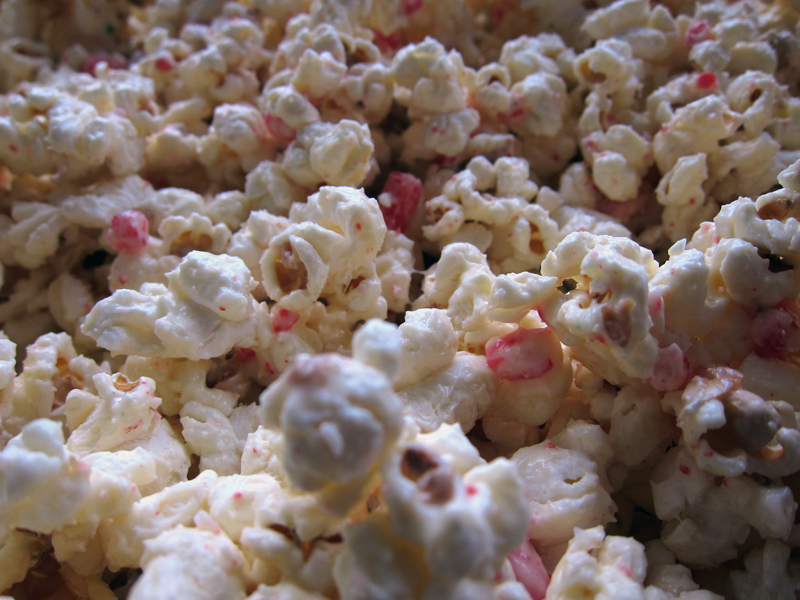 I’ve been hearing about white chocolate popcorn this year.. Will have to give it a go. Hope you’re having a great holiday! Lydia, get yourself some….it’s pretty addictive. Oh yes, Katrina, it’s delicious! Thanks, Joanne – I hope you & your friends love it. It would be a great addition to a games night – it was part of our Boxing Day games night treat! Yes, Joanne, agreed. Stock up on cheap xmas candy canes! Took this to a New Year’s Eve party last night and it disappeared quickly. Everyone loved it. gonna try this recipe with popcorn…. Well of course, Candy Elf!